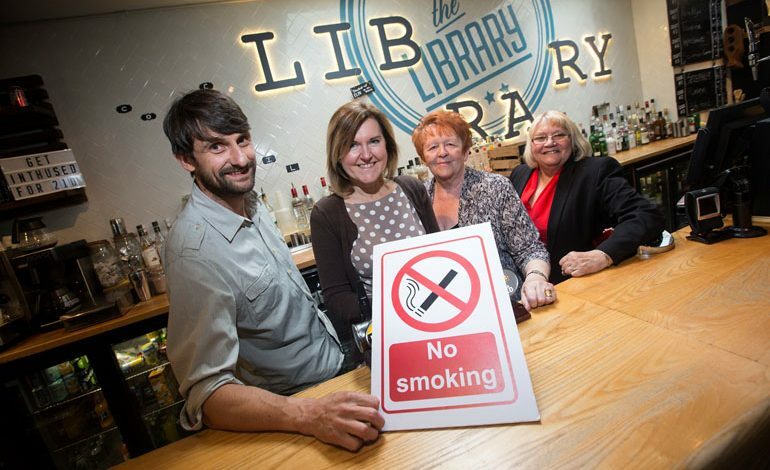 Ten years on from the introduction of England’s ‘smoke-free’ law, which banned smoking in enclosed areas and workplaces, local businesses and clubs are celebrating the successes of the smoking ban. Andy Nicholson, general manager of The Library bar in Saddler Street, Durham, has worked in the pub trade for 29 years, but quit smoking in 2003 after his son was born and says he could never imagine going back to the days of smoky pubs. Andy said: “The smoke-free law has been the best thing to happen to the trade and I don’t imagine many people would go back to the days when people smoked. “The silent majority completely support this. “Pubs have evolved – they were once places which didn’t serve food, allow women or show live sport. On Saturday 1 July 2017, the very same day that marks a decade of anti-smoking legislation, Bishop Auckland St. Mary’s Junior Football Club will become the first youth football club in County Durham to officially ask all spectators and club officials not to smoke or vape while attending their games. The club committee took the decision to go smoke free earlier in the year to help protect the health of their young people. Steve Coulthard, Chairman of Bishop Auckland St. Mary’s Juniors Football Club said: “Going smoke free at kids’ football seems like common sense. “Our young people are athletes and we want to give them the best experience and start at football as we possibly can. Durham County Council actively works to reduce the number of smokers in County Durham through its involvement in the County Durham Tobacco Alliance, which has the aim of reducing smoking prevalence in County Durham by 5 per cent by 2030. Cllr Audrey Laing, Chair of the County Durham Tobacco Alliance said: “We know that children are influenced by what they see, and young people are most at risk of becoming smokers themselves if they grow up exposed to smoking behaviours. “Durham County Council introduced a voluntary code in 2014 making children’s play areas in parks smoke-free. “It is great that Bishop Auckland St. Mary’s Junior Football Club has taken this step. Cllr Lucy Hovvels, Durham County Council’s portfolio holder for adult and health services, added: “We are delighted to be celebrating 10 years of smoke-free law. “It seems bizarre now to think back to the days when smoking was allowed indoors in the work place and public places. “The work of our tobacco alliance partners hasn’t stopped since the smoke-free law came into force. “The law has been a great landmark amongst many actions to reduce the impact smoking has on our communities, and we have seen a reduction of over 16,500 smokers in County Durham over the last five years. “Smoking is still our biggest killer, too many of our local residents will die so young from avoidable smoking related causes. • Pictured (above): Andy Nicholson, Dianne Woodall, Cllr Audrey Laing, Cllr Lucy Hovvels.